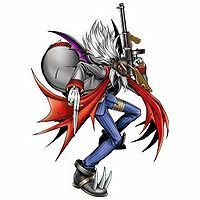 Though it is a Perfect, it possesses power surpassing that of an Ultimate, and is a Prince of the Dark Area which governs a legion of Demon Digimon. 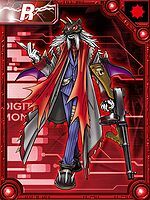 It shows cruelty to its enemies and kindness to its friends, and because of that charisma it is expected to gain a considerable number of followers among Demon Digimon. 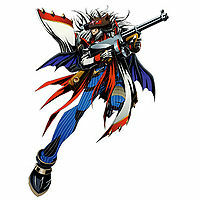 The bullets fired from its prided machine gun, "Oro Salmón", possess their own will, and will definitely chase the opponent to the "end of hell". 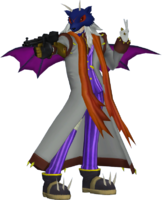 Its Special Moves are firing every single one of Oro Salmón's bullets (Hellfire), and a kick which unleashes all of its own pent-up dark Qi (Maverick). 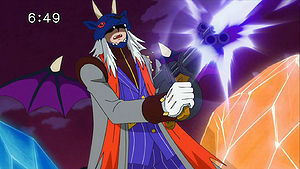 Oro Salmón is the work of the gunsmith who crafted Beelzebumon's favorite guns, the "Berenjena". 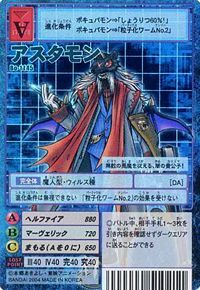 This profile matches its partner in the Digimon Reference Book. Title: 「ダークエリアの貴公子」 — "Prince of the Dark Area"
Short for Astaroth 「アスタロス Asutarosu」, a demonic duke who is said to be a high-ranking demon of hell who has many demons under his command. 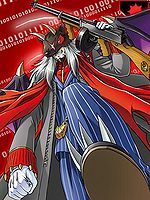 Anime/Manga Digimon Xros Wars: "Us, the Digimon Hunters!" 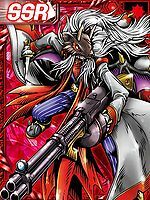 Hellfire  ヘルファイア Herufaia Shoots all of "Oro Salmón's" bullets. Maverick  マーヴェリック Māverikku Launches a kick by accumulating its own dark qi. 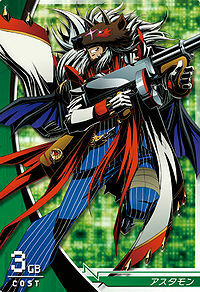 Astamon is the partner of Mogami Ryouma. He has spent most of his time in this form. 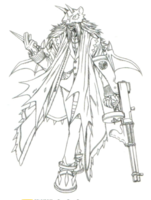 Here, his design is slightly different from the usual in that his mask is blue instead of brown. Beware of the Cuteness! The Cute Hunter, Airu's Trap! A Targeted Taiki! The Super Celebrity-star's War Cry! The Great Hunter Gathering! The Digimon Competition at South Island! All Will Be Revealed Now! The Secret of the Digimon Hunt! The Gathering of the Legendary Heroes! The Digimon All-star Showdown!! Burn Up, Tagiru! The Glorious Digimon Hunt! 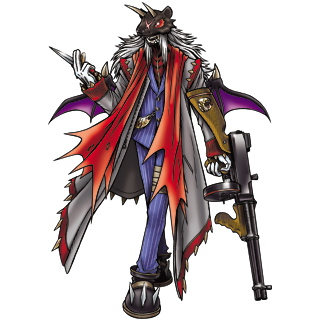 Astamon is a Mercenary Digimon which can evolve from Psychemon at level 25 and can further evolve to Belphemon (Sleep Mode) at level 41. 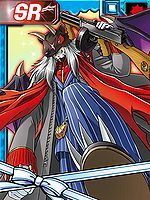 Astamon is available as a Digimon Medal. Followed by countless demons, the dark charisma! 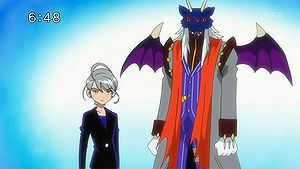 A prince of the Dark Area who governs over demon-type Digimon. Possessing power which surpasses even Ultimate levels, it is merciless towards its enemies and compassionate towards its comrades. Its favorite machine-gun to use is named Oro Salmón. ↑ Digimon Xros Wars: "Beware of the Cuteness! 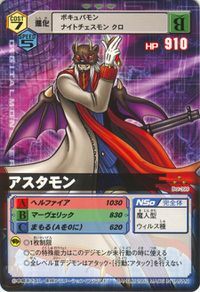 The Cute Hunter, Airu's Trap!" ↑ 23.0 23.1 Digimon Xros Wars: "All Will Be Revealed Now! The Secret of the Digimon Hunt!" ↑ Digimon Xros Wars: "The Gathering of the Legendary Heroes! The Digimon All-star Showdown!!" This page was last modified on 28 December 2018, at 15:30.